Cylindrical, Metal Finishing, Threaded Coupling, Harsh and Hazardous Environment, Power and Signal Connector. 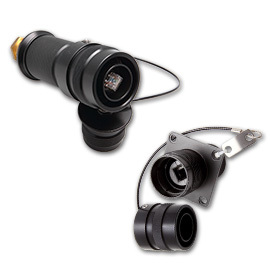 Amphenol Industrial Operations, the worldwide leader in explosion proof and hazardous environment interconnects, introduces a new, miniature, explosion-proof threaded connector specifically designed to allow a signal to pass through Zone rated areas using coax, fiber optic cables, or standard copper. The new Amphe-EX™ is complimentary to Amphenol’s industry-proven Star-Line EX™. In addition, the rugged Amphe-EX™ connectors are ATEX and IECex approved for Zone 1 rated applications. Fiber Optic Custom Cable Assemblies available up request.